Each participant will be required to wear full structural firefighting gear including boots, gloves, air packs (breathing on air), helmets, and masks. 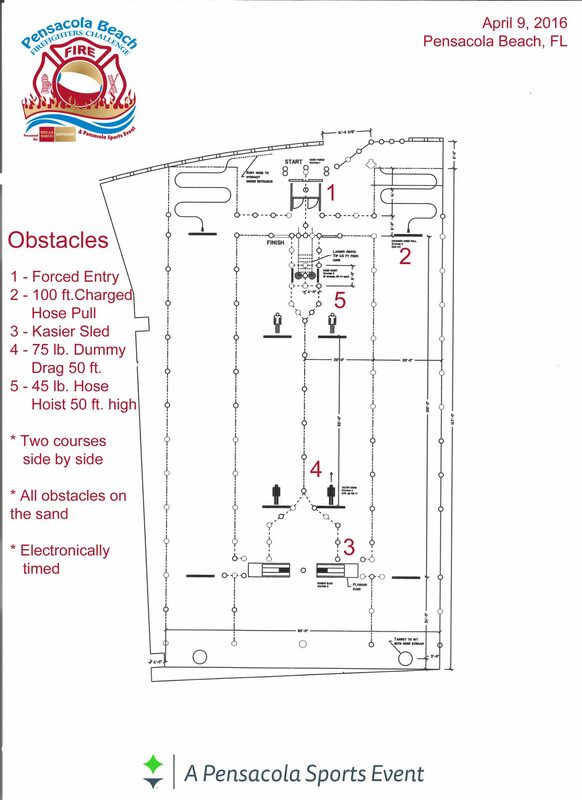 For the team competition, the first person will complete the first obstacle, then tag the second person (standing in the staging zone), and so on until the final person crosses the finish line. There will be two courses right next to each other – two teams/individuals will be going at the same time. Each team/person is racing for their best overall time, not against the next team/person next to them. Teams will have a seeding round on Friday to determine when they go on Saturday for their actual competition time. The order on Saturday will be: fastest time on Friday goes first on Saturday, slowest time on Friday goes last on Saturday. Each person gets one run of the course to score their best time. 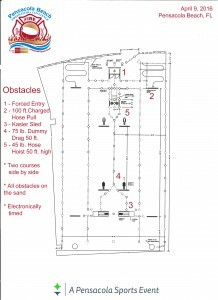 In the event there is a tie for an overall or award placement, the two teams will run the course again to determine a winner. The event will be manually timed using two times to verify each run. Team and individual check-in is on Friday, April 12 at the Gulfside Pavaillion next to the competition are on Pensacola Beach 5p-8p. You will receive your team packets, shirts, and event information. Additionally, the seeding round of the Team Competition will take place Friday night. This is NEW in 2019. All teams are guaranteed at least two runs on the course. Free food and drinks will be provided for all paid participants. Guests are $20. The event will be manually scored. Your time will start on “GO” from the announcer and will stop once you cross the finish line. There will be two timers for each team / person to verify the time. 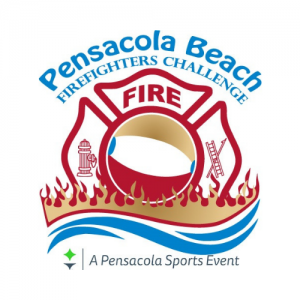 Following the competition on April 13, participants and guests are invited to attend the Pensacola Beach Firefighters Challenge Social at Bamboo Willies on the Pensacola Beach Boardwalk at 8pm. Free drinks will be provided. Cost is $20 and includes an event cup. Tickets can be purchased at the competition or at the social. NEW FOR 2019 – All teams are guaranteed two runs on the course. A seeding round on Friday and then the main competition on Saturday. * – Timeline subject to change pending number of teams and participants. Final timeline will be posted at the Team Check-In. If the entire weekend is a washout, there will not be another make-up date.